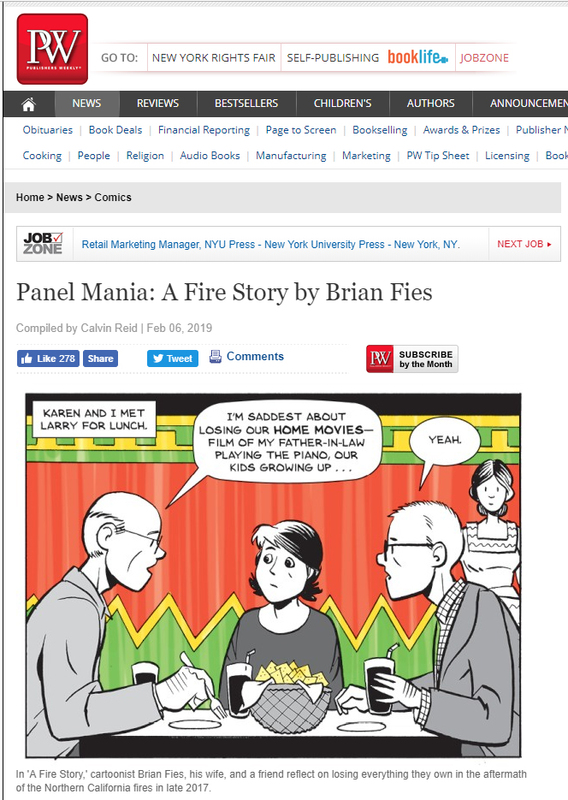 From time to time, Publishers Weekly--"the Bible of the book business"--previews an upcoming graphic novel in its "Panel Mania" feature. Today it's mine. If you want a sneak peek at nine pages of "A Fire Story" a month before it's released, here you go! A couple of behind-the-scenes notes: Pages 68 and 69 are obviously a two-page spread that'll form a single big picture in the book. Yes, I drew all those dots, albeit digitally, in a little nod to comic book artist Jack Kirby. The text-heavy "Larry & Mary's Fire Story" is one of five interviews I did for the book, trying to tell a cross-section of OTHER people's fire stories in their own words, in addition to mine. Some of them are pretty dramatic. This is the first time a big chunk of "A Fire Story" has been released to the wild. I'm nervous.